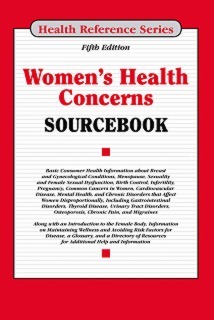 Women’s Health Concerns Sourcebook, Fifth Edition, provides updated information about the medical issues of most significance to women. It explains female anatomy and reports on women’s health and wellness topics, including vaccination and screening recommendations, fitness and nutrition guidelines, and tips for healthy aging. It also discusses breast health, sexual and reproductive issues, conditions that disproportionately affect women, and the leading causes of death and disability in women, including heart disease, stroke, and diabetes. The book concludes with a glossary of terms related to women’s health and a directory of resources for additional information. It also includes access to Health Reference Series Online. Part I: Introduction to Women’s Health provides basic information about female anatomy and physiology, including the reproductive system, menstruation, puberty, and menopause. Statistics related to women’s health are included, and special concerns among specific female populations are addressed. Part II: Maintaining Women’s Health and Wellness provides guidelines for pursuing a healthy lifestyle. It includes nutrition and exercise recommendations, facts about obesity and weight management, and tips for handling sleep problems, stress, and common concerns associated with aging. It also discusses ways to prevent or mitigate risk factors for the leading causes of death among women. These tactics include following recommended health screenings, receiving appropriate immunizations, controlling high blood pressure and cholesterol, and avoiding the use of tobacco products. Part III: Breast and Gynecological Concerns describes female-specific health matters, including breast disorders and changes, menstrual irregularities, and menopause. Disorders of the reproductive organs and pelvic floor are also explained, and the part concludes with information about common gynecological procedures. Part IV: Sexual and Reproductive Concerns presents information about sexuality and sexual dysfunction from a female perspective. It also looks at topics related to fertility and pregnancy, including birth control methods, infertility treatments, abortion, prenatal and postnatal care, and labor and delivery. Other topics related to maternal health, such as breastfeeding, postpartum depression, and dealing with pregnancy loss, are also addressed. Part V: Gynecological and High-Prevalence Cancers in Women takes a look at cancers that are of special significance to women. These include cervical, ovarian, uterine, and other cancers of the female reproductive system. Cancers that occur more often in women than in men—such as breast cancer and thyroid cancer—and other cancers that are among those most frequently diagnosed in women—including lung, colon, rectal, and skin cancers—are also discussed. Part VI: Other Health Conditions with Issues of Significance to Women focuses on disorders with a high or disproportionate incidence among women, including Alzheimer disease, arthritis, autoimmune disorders, migraine headaches, osteoporosis, and thyroid disease. It also looks at the ways in which women experience some common disorders differently from men, and it describes special issues related to women’s mental well-being. The part concludes with Zika virus and its effect on pregnancy. Part VII: Additional Help and Information provides resources for readers seeking further assistance. It includes glossary of women’s health terms and a directory of organizations related to women’s health care needs.